In large bowl, stir together Bisquick mix, milk and eggs until well combined. Divide batter evenly among 3 squeeze dispenser bottles. Squeeze a few drops red food color into 1 bottle, and blue food color in another. Use a skewer or the back of a long spoon to stir food color into batter. Leave other bottle without coloring. Replace caps to seal. Squeeze small circles of each batter onto hot greased griddle; cook until lightly golden, about 3 minutes. Arrange pancakes on plate. Place frosting in piping bag fitted with tip; pipe frosting on pancakes to look like fireworks. Sprinkle with decorating sugars. 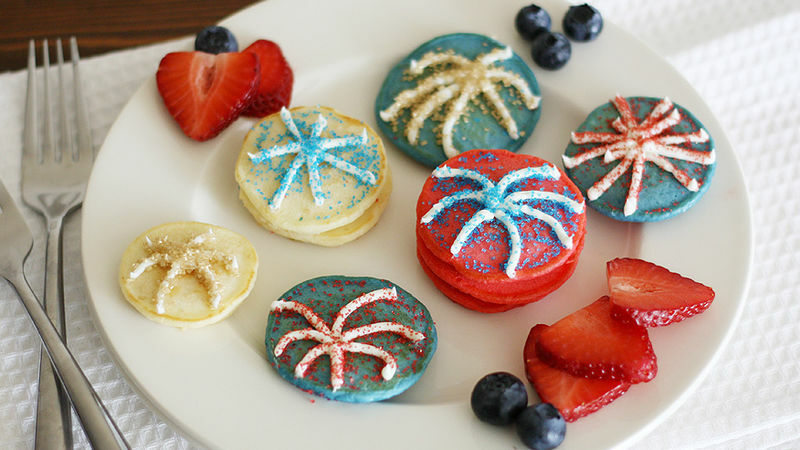 Decorate tops of pancakes with more than just fireworks: Flags and stars work great, too! Serve pancakes with fresh strawberries and blueberries, if desired.